Born in Belleville, Ontario. He moved with his family to Winnipeg at the age of six and spent the rest of his life there. 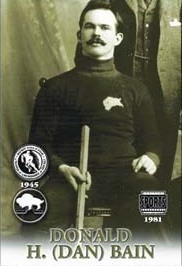 Bain was a great leader on the ice who played centre and captained the Winnipeg Victorias in four Stanley Cup challenge rounds. He never played professional hockey, but was a key member of the Victorias when they twice won the Stanley Cup. In 1896 they defeated the Montreal Victorias and in 1901 they beat the Montreal Shamrocks.